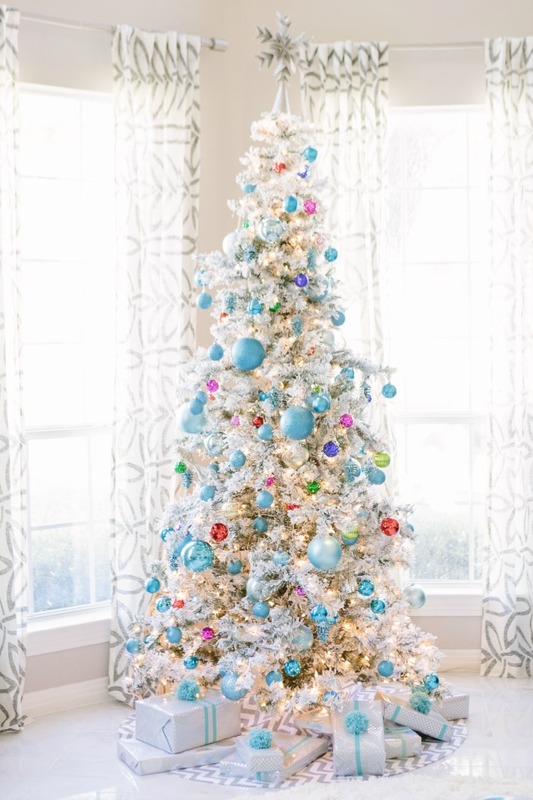 Who else is excited to decorate their home for the holidays? Or maybe you’ve had decorations up for weeks already?! In our family, Thanksgiving weekend has always been the time when we turn on the Christmas music, make some hot cocoa, and pull out all the Christmas decorations from storage. My favorite time of the year! This year I got a little head start on our holiday decorating thanks to a project with hayneedle.com. We partnered to transform our formal living room into a winter wonderland for the Hayneedle blog. My vision for this room was to make it a family gathering space away from the TV. The circular room and high ceilings posed some interesting decorating challenges, but putting a game table and comfy chairs right in the middle of the room was just the cozy touch it needed. I’m a Scrabble fanatic and Stella is just starting to learn checkers, so I’m hoping we can make the time to sit down for several games in front of the fire over the holidays. 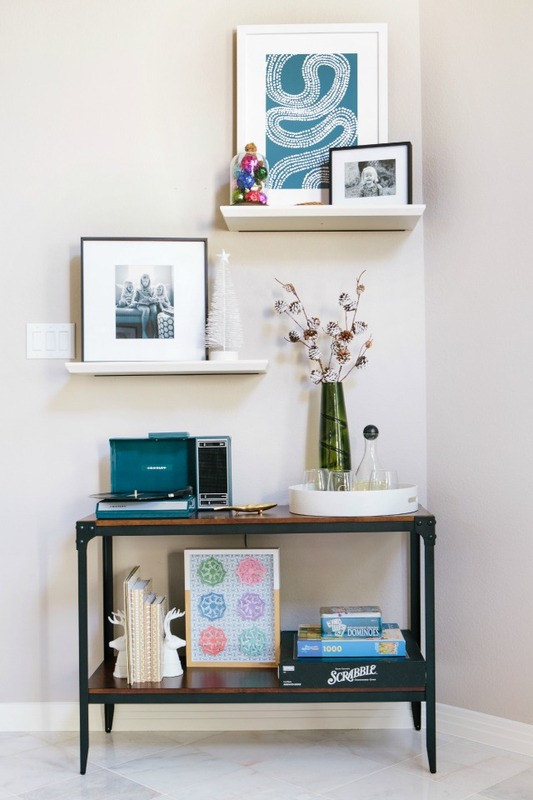 One one wall, I created a little entertainment space by combining a console table and floating shelves. 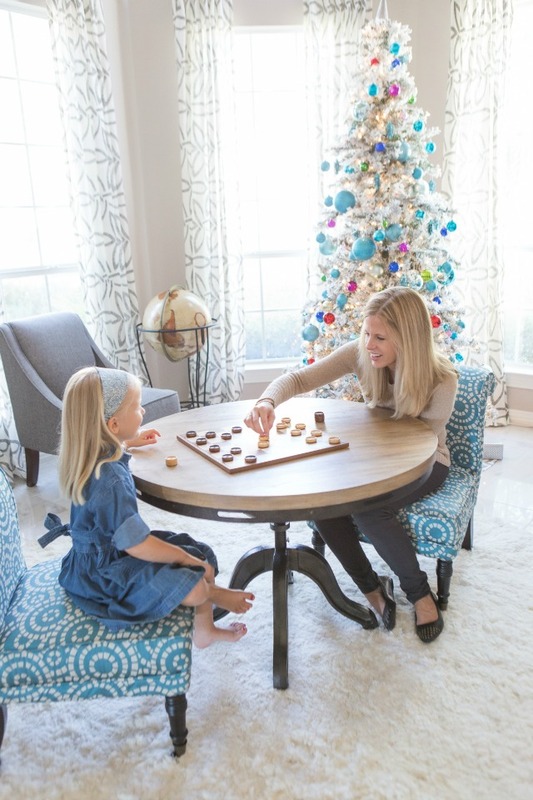 The table provides a serving surface for drinks and snacks as well as game storage underneath. I’m so excited about the addition of this Crosley record player. My mom had a set of Christmas records that we played every year. Henry Mancini, Andy Williams, and Johnny Mathis were favorites. Playing these records for my girls brings back so many memories of being a kid during this magical season! The mantel is one of my favorite parts of the room. It is my first time using a flocked tree and matching flocked garland and wreath. The flocked look is absolutely gorgeous. The best part is that they are all pre-lit! If you don’t have a pre-lit tree, I’m telling you, it is a life changer. Having the wreath and garland pre-lit as well makes decorating that much easier and adds such a beautiful glow to the mantel at night. 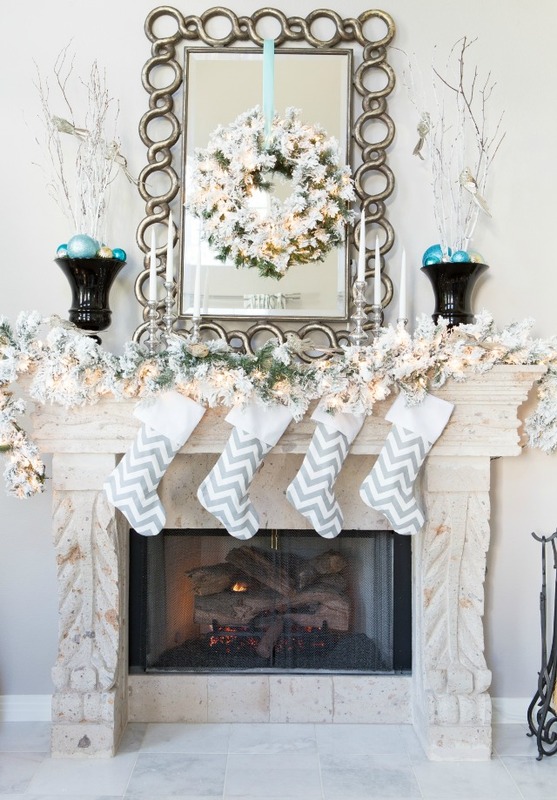 Be sure to head over to the Hayneedle blog to see more photos of our living room and my tips for decorating your mantel for the holidays. Check out my Styleboard to shop this look.